As we all knows (Kancil users), the seat sponge for Perodua Kancil is a little bit hard and not very comfortable. 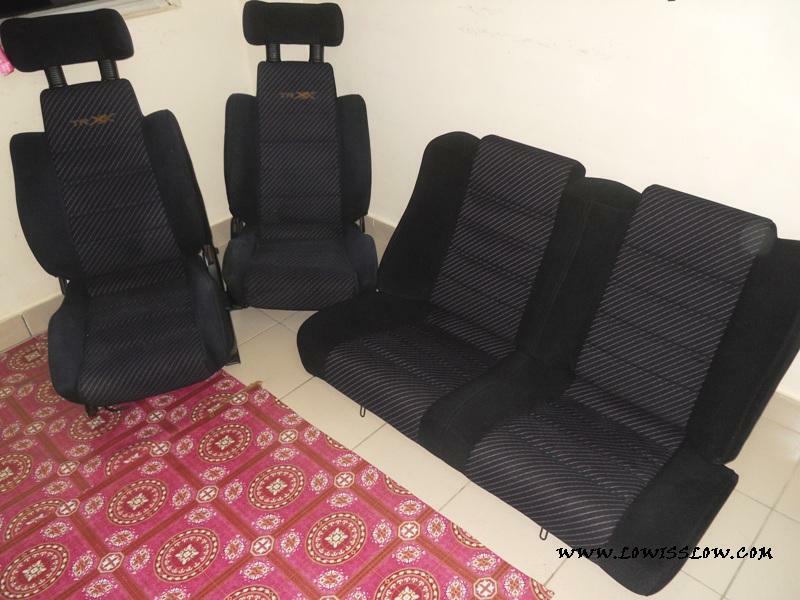 Because of that, I decided to change my stock seat to a used seat taken out from Daihatsu Mira model, imported from Japan; a lot of variation to choose from L2, L5 series, mostly come with soft sponge. You can found it at the used auto-parts shop (halfcut shop) with price range from RM450 - RM700 depends on the type and conditions of the seat. 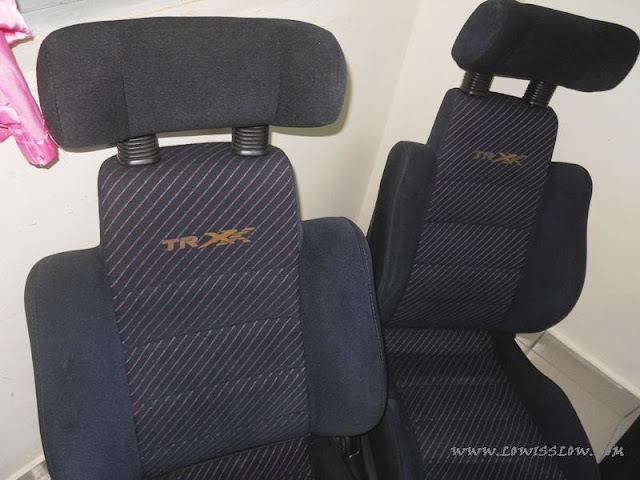 I choose L200s Gold Traxx seat. It is a semi-bucket seat, and got soft sponge that suit everyone driving needs. Two-seater rear seat, divided with soft bump at the middle. So here i want to share with you on how to install it by yourself, in other word Do-It-Yourself (DIY). Actually it is very easy to do this, just plug and play. Tools needed only ring wrench size 12 and 10. 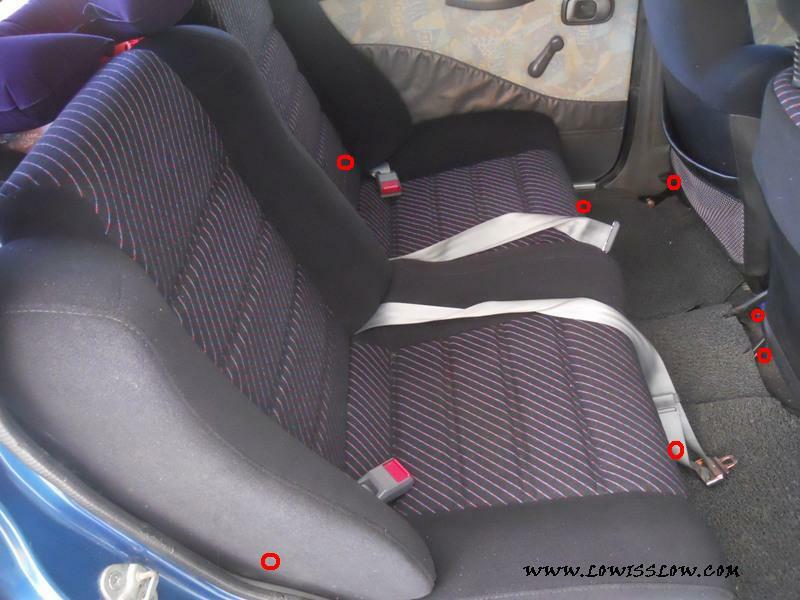 We start from removing process, I suggest you remove rear seat first so that more space for you to remove front seat. 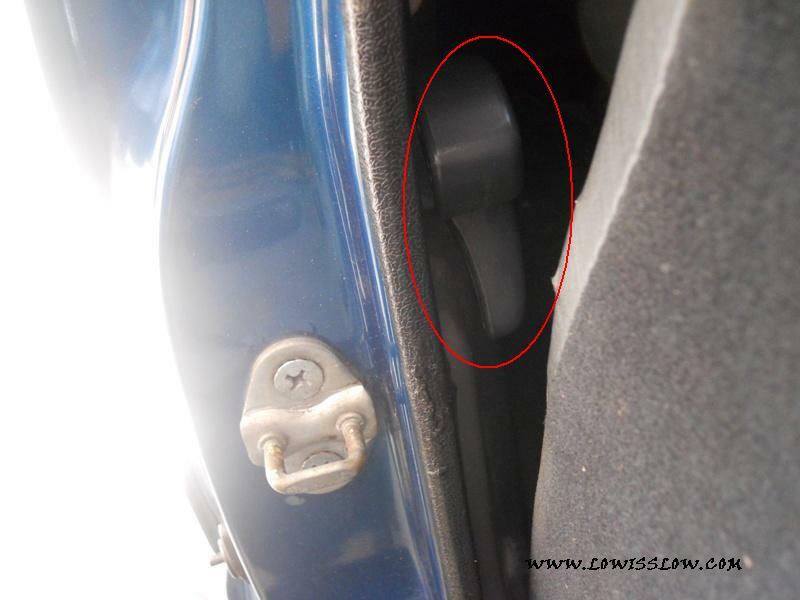 For rear seat, there were two screws located at the rear leg room, and another two screws located behind the seat. You can easily find it by folding the rear sit. Refer to the picture below, I marked it in red. For the front seat, just removed 4 screws for each seat. two at the front and another two at the back of the seat. All together 12 screws removed using ring wrench size 12. Then, installation part of the Mira's seat. All the screws position are the same with stock seat. 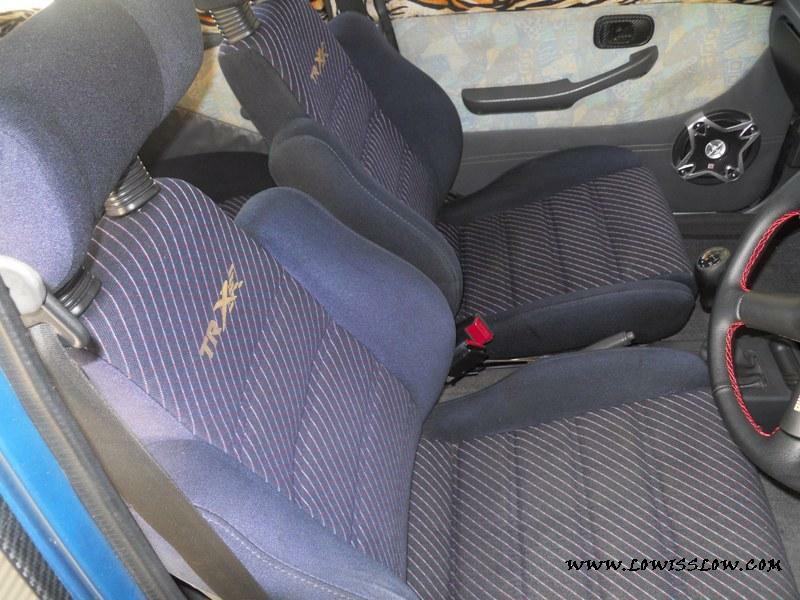 But for my Mira seat, It was taken out from 2-door Daihatsu Mira L200s where the rear seat is unfoldable type. So I have to remove the rear seat folding's lock on both side by using ring wrench size 10. Picture above are my Mira's seat. For your information, Daihatsu Mira L500 (google it for picture) rear seat a little bit small compared to Perodua Kancil's seat. So before you install it, you need to send it to the sofa repair shop to extend the sponge length about 2 inches on the left and right. Then it can be fitted nicely in your car. For the front seat, just plug and play. This is used item, make sure to wash it first. That's all and feels the different. di mana dapat seat ne bro???? ada ko tau kedai2 di k.k yg ada jual seat L2s atau L5 yg murah2 kah bro?? The Astra is very well thought of and has done a lot to dispel Vauxhall's old reputation for poor build quality. Cheap to run, good looking, nothing much wrong with it. bos mahu tanya..kalau dah buka lock tu, seat sandar ikut apa? itu papan speaker?